It has now been just over two years since I moved with my family to Finland from the United States. This two year milestone is a good time to reflect on my experiences as an expat and hopefully learn from them and continue on with my voyage. I thank you for taking the time to read my blog and I hope it is something that you enjoy and can learn from as well. I hope that in my writing I never come off as arrogant or self-absorbed because that is not my intention. Yes, I know this blog is mainly about my personal experiences living abroad but since I have a larger audience now, I would hope people reading it like yourself enjoy my ramblings and perhaps gain some insights as well. I think it could be especially useful for someone wondering or perhaps considering to make a move abroad. Time really does fly and before you know it the children are growing up and the years are passing you by. So much happened during my second year living abroad in Finland. At this time last year, we purchased a home in Espoo and that experience in itself was quite scary, but we survived. Buying a home in a foreign country can be daunting, but once we figured out the rules and got through the red tape, it wasn't such a bad experience. Fortunately the interest rates in Finland are at rock bottom now, so it makes perfect sense to buy instead of renting even if only for a few years. Life went on as usual, my children kept busy with their school and sports activities, I remained working for the same start-up in downtown Helsinki and we went on several trips and adventures. I was also able to see some amazing artists live in Helsinki, including Steve Vai, Paul Gilbert, Omar Rodriquez-Lopez, Rush, Kiss and The Smashing Pumpkins. Last winter (2012-2013) was long and cold, but we were able to enjoy winter sports and other winter activities. But like all things in life, the winter came to and end, so it wasn't so bad. This last summer was fairly dry and warm and was probably one of the best in Finland in a long time. The seasons change and everything seems to balance itself out. Life is fairly normal now, we know more people in the neighborhood and in the school network and we are familiar with most of the local shops and know how to get from place to place without much hassle. I have learned so much from living abroad and I am still learning more almost everyday. It is always eye-opening to see how things are done in a culture and country other than you own. Sometimes you are shocked and others times awed by the little things that you are not used to, but each day you learn and grow. I am starting to crack the code of Finnish society, but it definitely takes some time and effort. Finns are not going to become your best friends overnight, there is trust and patience involved. I have learned much about the Finnish workplace and the value of time off. I have learned how people here have a greater separation between work and personal life. I have learned how folks are more efficient with space and how they recycle more. I have experienced the silence on buses and the peaceful walks through the endless forests. Of course, learning and experiencing should never stop as it keeps one's inner fire burning. I think what I have learned this far in life through my travels and living abroad is that we should always keep our minds and hearts open, we should never stop learning and experiencing and try our best to avoid stagnating. Of course it is easier said than done, but let's not forget that we only have one life and it is short so why not try to live it to the fullest? Thanks for commenting on my blog! I also like to see fellow American's views on living in Finland. I just joined your blog and I am enjoying reading your posts. 14 years in Finland now, wow! I also live in Espoo. Great blog. Thanks for sharing your experiences. I´m a German & have been living in Finland for almost 9 years (with my Finnish husband). I like that you write so thoughtfully & try keeping an objective view. How have you dealt with homesickness? What bothers you about living here & have you ever considered going back to the U.S.? Thanks for your comments on my blog. I appreciate getting positive input from folks! Wow, 9 years is a long time and congratulations on learning Finnish! It is quite a task for anyone. I read your comments from my other blog article. I know what you are saying, in my 2 1/2 years living here it is been difficult to connect with Finnish folks, though I have gotten to know a few of them fairly well. :) They are tough nuts to crack. A friend of my said that they are like coconuts, hard on the outside and soft in the middle. Well, as an American I definitely pride myself as being open minded and willing and laid back. Glad you connected well to my fellow Americans. I usually deal with homesickness by planning my next trip somewhere. We have traveled extensively since moving to Finland and hope to continue that trend. Also, I have made 3 trips back home since moving to Finland and it was very nice to get back to California. Well like moving any place away from home, things are going to be different and some things bothersome. Without speaking about the obvious ones: long and dark winters, the thing that bother me here most are the extremely high prices for groceries and other goods, the low wages, high taxes, lack of customer service, lack of good fresh produce, and just overall introverted nature of many of the Finns. Yes, we have considered moving back to California, but do not have an actual timeline yet. We might move back in a few years. We still have a home in California that we are renting out for now. Nice to hear your comments! Hi! I have enjoyed reading your blog, too. I was wondering if you could answer a few questions for me. I am interested in studying at the University in Helsinki, but I have a husband and 3 children. Are there jobs available in the area? My husband is in IT. Also, what are the housing costs as far as renting goes? Lastly, why did you decide to move there in the first place? Thanks so much! 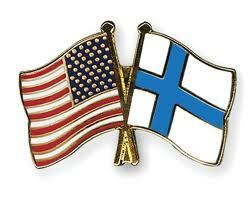 From what I read online, American citizens have to file income tax to both Finland and United States. What is the situation with that, how much extra taxes do you end up paying percentage-wise compared to a Finish citizen or other expat that doesn't get taxed by the country of citizenship? Can you elaborate a little more about Finish people being inclined or not to form friendships/relationships with foreigners. I am a student in Finland an interestingly, I have lived in Finland for 2 years (like you in 2013:D) but I moved 2 times and actually I have never stayed long time in Helsinki. Totally agree with you that walking in the forest is so so nice and anyway we will get used to Finland (and there might be something happening again haha, we are always surprised by Finland, even we think we get used to it :D) do you still want to stay in Finland after your kids graduate? Hi Unknown, Sorry for the late response as I haven't checked this blog much lately. You might want to consult with your local tax authority, but yes you are required to fill out taxes in both countries if you are a US citizen. It shouldn't be that bad, unless you still have lots of income in the US while you are living abroad. Yes, Finns are much slower to warm up to friendships than Americans, but once you gain their trust you will have a loyal friend for life. Most Finns are introverted so it takes them a longer time to get to know you, just give it some time! I saw that you no longer live in Finland, but I have a question for you. A good friend of mine moved to Helsinki about a year ago to marry the love of her life. Well, she's not doing too good. Not having friends to go do things with is really getting to her. Can you recommend any groups that she could join or where expats go to meet up please?